Environmental enthusiasts in Nigeria, on Saturday, March 17, 2018, joined other folks across the world to mark the inaugural Global Recycling Day with an event “A Walk for Sustainability and Recycling” in Nigeria’s Federal Capital Territory, Abuja. The walk was put together by a leading recycling company in Nigeria – Chanja Datti Recycling, in collaboration with Transcorp Hilton – Abuja, #PickThatTrash initiative, and “Stop Don’t Drop”. 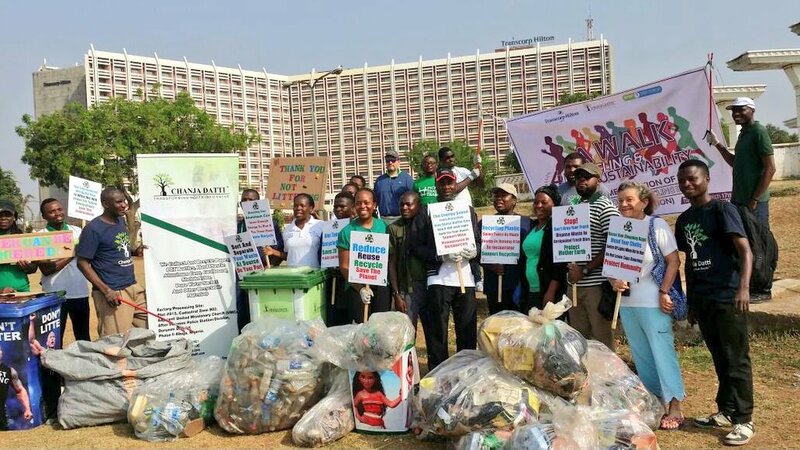 Participants engaged in a 2-hour long roadside walk from the Transcorp Hilton gate, through the Federal Secretariat, to the Eagle Square and back to the Unity Fountain, beside the Transcorp Hilton; a total of 112kilogram of recyclables were gathered at the close of the event. The Global Recycling Day is initiated by Brussels-based Bureau of International Recycling (BIR) and has called on the United Nations to annually recognize March 18 as Global Recycling Day in its roster of awareness days. The aim of Global Recycling Day is to unite people across the world, highlighting the need to conserve our six primary resources (water, air, coal, oil, natural gas, and minerals) and celebrating what is described as ‘the seventh resource’ - the materials we recycle every day. It is believed that in Johannesburg, Global Recycling Day’s Manifesto was launched along with a public clean-up campaign with the help of the Catholic Diocese and the City of Johannesburg. While at the head office of the Australian Packaging Covenant Organisation (APCO) in Sydney, over 50 academics and industry experts gathered to recognize Global Recycling Day and discuss cross-sector collaborations.